Sliced, dried and packed within hours. Rich in vitamins and minerals - no added sugar or sulphites. Excellent as a healthy, natural snack. An easy way to get children to eat fruit. Lightweight resealable packs to take anywhere – trekking, cycling, after swimming, or just sightseeing! 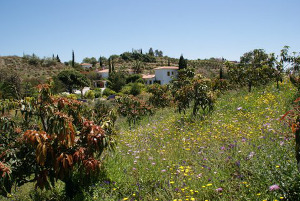 Our area has become famous for its subtropical fruits of mangos, avocados, lychees and guavas. Our plantations are 1 mile inland overlooking the Mediterranean in Southern Spain and have 15 hours of sunshine a day during the season. It's not surprising they are sweet and juicy as they are only picked when really sun-ripened. Drying fruit is an age old tradition and dehydration is the best way to preserve the essence of raw fruits. It protects enzymes which help to regulate the digestive process in the body, preserves important vitamins and minerals, gives a high fiber content and healthy carbohydrates which give energy. 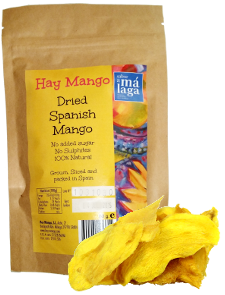 Our dried mango is the sweetest grown and sliced in Southern Spain. This is because the mangos are only picked when they are at their ripest. The mangos are then sliced and organically dried without using added sugar or sulphites.